One of the biggest trends in food entertaining is the continuing evolution of platters and grazing boards. From fruit to cheese, charcuiterie to sushi, platters make a big statement on any table and help to make entertaining easy to execute and maintain. 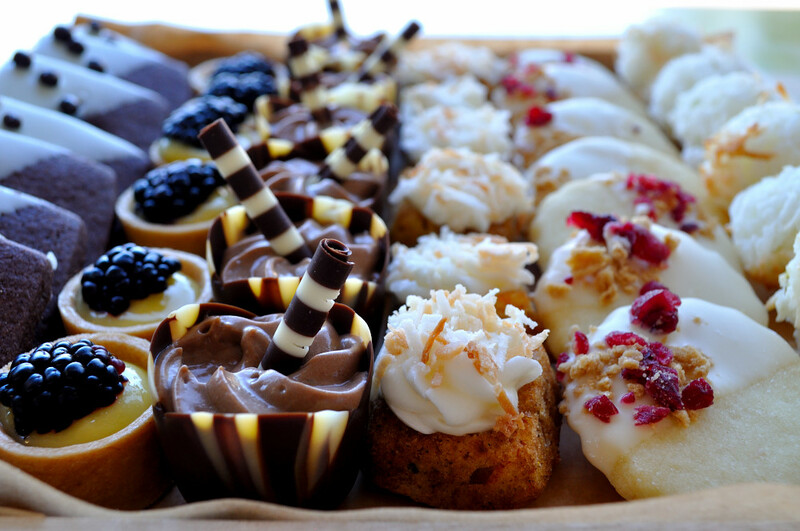 As caterers we love platters for many reasons. They allow us to group food by category which ensures that guests with dietary concerns can select only those items that fit their needs. Various boards can be staged in several locations around a room or venue to increase movement and can be freshened up or replaced as they empty to ensure food safety and quality. Plus, they look great. When served en mass, food can entice and en trance. After all, we eat first, with the eyes. 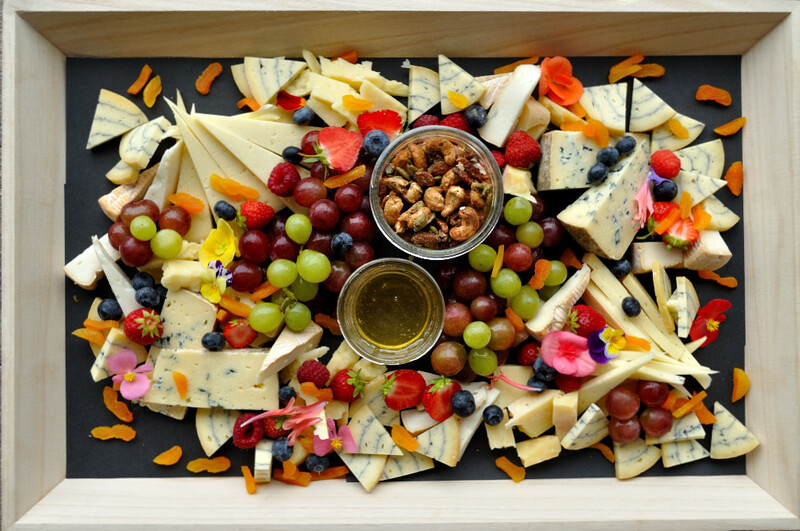 A boring wheel of brie, a block of cheddar and chunk of blue cheese can be quickly transformed into stunning cheese display. All it takes is a little imagination. When we construct our platters we keep a few house rules in mind to help make each bite beautiful. 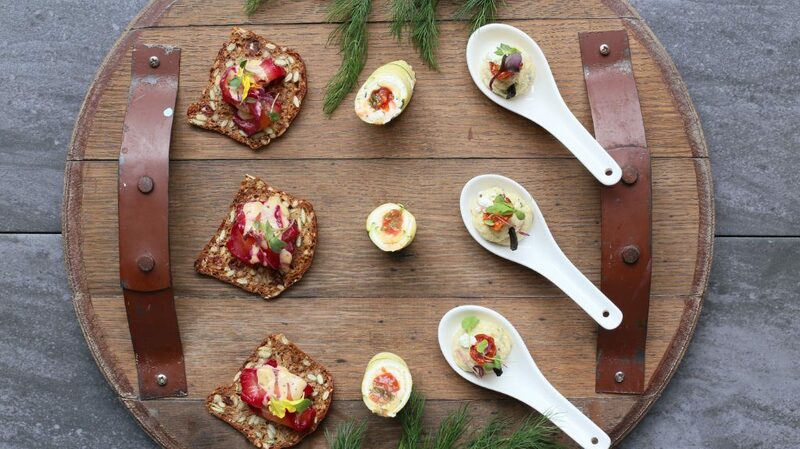 Here’s a few pro tips from our catering kitchen to make your next food board – magnificent. Colour plays a huge role in food presentation, the more colour and dimension you add, the better it looks. Nature gives us so many colours, textures and shapes to play with, how you present them is the difference between pure eye candy and a divided deli tray. Accent with fruit, berries, a variety of breads (some seeded, some dark rye). Play with colourful condiments or pickles. Try mango chutney on a cheese platter alongside a good caponata with cheese. Accent with gherkins or caper berries on a tray of smoked salmon, punctuated by rolled balls of cream cheese, dusted with dill, thin slices of purple onion and cool cucumber for contrast and flavour. Add contrast of colour and texture with edible petals and leaves. Try microgreens, pansies, nasturtiums or edible varieties of begonia. Whenever possible we break down larger items into bite sized pieces. This makes for easier nibbling, and allows guests to consume small amounts while still carrying on conversation. Our rule of thumb is one to two bites, maximum. We cube or break cheese and peel, cut or slice products as need then layer items to fill the space we’re working with. This allows for easy access to a variety of ingredients and helps to keep a tray looking fresh and full. The same principle applies to any platter, alternating between varieties of similar goods and grouping items adds symmetry and structure. As industry professionals we spend a great deal of time sourcing quality. Some of our current favorites can be easily found or at your favorite deli counter. Ask about their selection of Ontario and Quebec cheeses, which are truly outstanding. (We always vary by age and include at least one goat or sheep milk cheese for variety.) A trip to Ottawa’s Seed to Sausage store on Gladstone is a great stop for cured and smoked meat products (some of which we stock our shelves). La Bottega Nicastro is packed with European temptation as well as local artisanal product. (Beware the olive bar!) And we never tire of the exotic produce and the selection of ready-to-go products at T & T Supermarket or the MidEast Food Center. Never skimp on quality and when it comes to making a great platter – more is more. In our line of work we’re constantly on the lookout for great ideas in pairing and platting. Try a quick Google image search or spend a little time on Pintrest or Instagram and mark your favorites for future entertaining reference. Your next foodie inspiration could be just a click away!